Whenever the economy goes downhill, every Internet marketing millionaire under the sun goes into hyper mode to devise the next great scheme to inspire people to get started making their millions on the Internet. I guess this product is always on the mind of Internet marketers…especially Internet marketers who make how-to Internet marketing products. But, I’m seeing even more new so-called “systems” being made available this month than the last 6 months combined. Why? Because layoffs are still happening. People are getting more desperate than ever. And, the last holdouts, those who have scoffed the Internet for years are finally giving in, so to speak, and trying to figure out how to take the plunge and start making millions online. The truth is, I don’t care what process or system you buy into. If you are new to the Internet, you are going to have to go through the wickets just like everyone else. You’re going to learn some things the hard way. You will attempt to learn some things on your own and get massively discouraged when things don’t quite work the way you planned…even if you follow their systems step-by-step. You’ll be scratching your head wondering why Internet marketing comes so easy to everyone but you. You’re going to spend some money and see little or even no return. You will be tested to see if you have what it takes to persist. How’s that for some Friday encouragement? Not very inspiring is it? Well, I’m just telling the truth. Whether you follow someone’s proven system or go it alone, nothing comes easy on the Internet or any other part of operating a business. Even the hotshots you’re getting emails from that want to tell you their stories of how they got started online and how non-technical they were and how they didn’t do any work or didn’t even have a computer…have gone through the wickets to get to where they are. 1. Crash and Burn – If you think every Internet marketer just came from some corporate job and one day, threw a YouTube video together in the backyard and made millions from it going viral, well think again. They’ve all had ideas that were tried but their hopes and dreams of immediate success just vanished before their very eyes. But, that didn’t stop them because they were…. 2. Starving for Success – Every successful Internet marketer I know was so hungry and even starving for success that nothing stood in their way. If one thing didn’t work, they changed course and tried something else. They lived and breathed Internet marketing because making that success was more important than anything to them. The question, “How many hours of my day do I need to spend on (fill in the blank)?” NEVER entered their minds! 3. Charisma – You’ve seen the speakers on-stage with their jokes, stories and sales pitches that you just can’t say no to. Many Internet marketers do not have that kind of charisma, but some have charisma in what they write. Or, they have charisma in how they participate on social networks. Some simply have more of a psychological or scholastic charisma in that they have a knack for looking at statistics and predicting what kinds of promotions people online might respond to. One of my former clients who went off on his own makes $50K a month online doing just that. No speaking gigs. No books written. Just has a knack for looking at stats and promoting affiliate products online. So, my point is that you should beware of falling prey to the get started online pitches you’re hearing about because most of them know first-hand that most people will not have the experience, the starvation or the charisma to work through their systems and methods. But, they also know you’re not going to ask for a refund either. They’ll gladly take your money though! If you do buy into any Internet marketing educational products, be easy on yourself. Don’t beat yourself up when you don’t “get it” or discover it’s more work than you thought. Because any process to make a dime online will be a process and something to achieve over time. Enter into the process with that in mind and you will have peace of mind and accurate expectations. So, What CAN You Do to Get Started On the Internet? 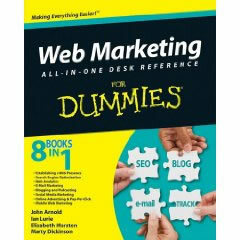 If you have a few bucks to spend, I suggest buying my book, Web Marketing All-in-One for Dummies. They tell me it’s on shelves in bookstores around the world. My portion is the first 190 pages or so. Then, head over to facebook and “Like” my facebook page that I’ve setup where we discuss all kinds of different Internet marketing related topics. If you’re really strapped for cash, you should at least sign-up to be on my main email list. When you sign-up, you’ll get immediate access to my new whitepaper that describes the 6 steps of the A.C.T.I.O.N. process, a step-by-step guide for starting online or taking your business to new levels using the Internet. Finally, I’ll just close this blog post by saying, getting started online is no overnight process. You’re going to need to really focus on this and make the commitment to persevere for an entire year. Make it a part of your life and your lifestyle. That’s when you will start to see the rewards. Let me know if I can help along the way. Good luck! Whenever I give a workshop and start talking about selling on Facebook, someone eventually raises their hand and comments, “I thought if I try to sell something on Facebook that they would shut me down.” If you try to blatently spam your followers like crazy from your main Facebook account, then sure, you run the possibility of Facebook blocking your account. But Levis are selling on Facebook just fine according to DMNews, where they talked about how Levis has made a page for their pants and are building quite the following as a result of their Facebook page promotions. You don’t have to be Levis to sell product through Facebook. You just need to create individual Facebook “pages” for the product you’re wanting to promote and do all your promotions through those pages. 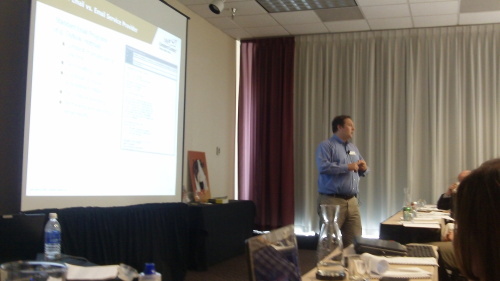 Zakary Barron is doing a great job presenting best practices of email marketing. Focus on email marketing is a great follow-up to what I was presenting to the group, which was social networking on Twitter, Facebook and Linkedin. 1. Email is not dead: Proof: Didn’t you check your email this morning? Zakary told me our workshop was closed off to registration at 120. We had a couple of walk-ins that we managed to squeeze in, but we’re definitely going to do this again. Zak says there were 40 on a waiting list. So if you missed it, look for another workshop day to be scheduled soon! Great job Zak!